Will be available beginning on June 1, 2019. Will call tickets are available at the main ticket gate on Saturday only. Children 16 and under must be accompanied by an adult. We do not offer discounts on tickets other than those advertised on this page. Tickets are required in order to enter the fairgrounds on Saturday, August 17th, until the festival ends. Thank you. Will call tickets are only available at the main ticket gate on Saturday. Gates open at 4:00 p.m. on Friday and 11:00 a.m. on Saturday. 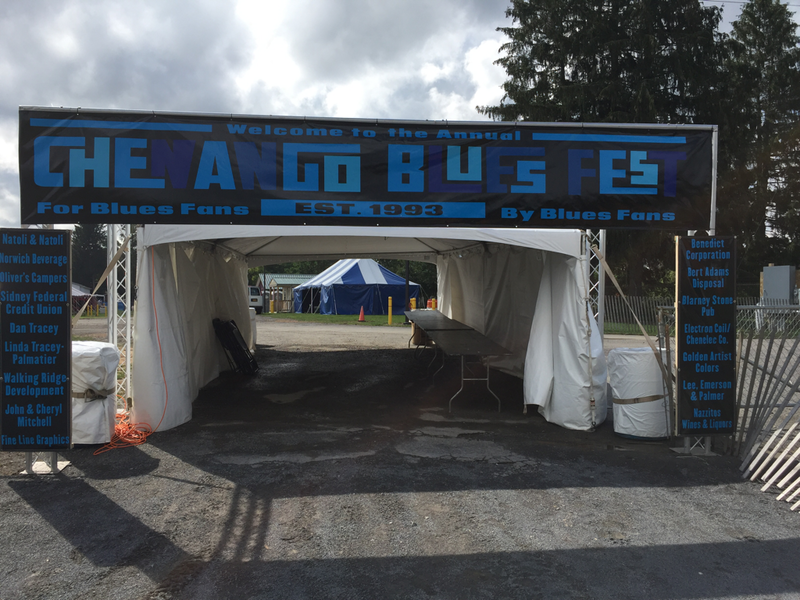 Become a Chenango Blues Fest VIP! $400 level festival sponsors receive 4 tickets to the festival and 4 backstage hospitality passes. Enjoy preferred seating and a wide variety of free beverages and hors d'oeuvres. Your contribution supports this volunteer run, non-profit and award winning organization! Sponsorship requires a (tax deductible) donation of $400 or more. Individual VIP tickets are available for $125.00. For more information regarding sponsorship call (607) 334-5653 Ext. 1 or e-mail eric@laralmgmt.com. Group discounts are available for groups of 10 adults or more. Mail a self-addressed stamped envelope and a check for $20 per ticket for 10 or more tickets to Eric Larsen, 54 Borden Ave., #B-22, Norwich, NY. Group orders by mail end August 1, 2019.
Credit card orders will be accepted by Commerce Chenango for advance sale at $25.00 per ticket + $5.00 service charge. Call (607) 334-1400 from 8:00 - 4:00 Monday through Friday. Ticket orders that are purchased and mailed out need to be placed by August 9th. Tickets being picked up at the Chamber may be placed through August 16th and picked up by 3:00 p.m. In an effort to reduce costs for fans we will continue to offer mail order tickets this year with no service charge. It's a little old school, but it's also cheaper! Just send a check made out to Chenango Blues Association along with a self addressed stamped envelope to us at the address below. All mail order requests must be received by August 2, 2019. Tickets available at Advance Sale price until approximately 10:00 p.m.